Home » Connectivity » More than just a dream – What’s the idea behind Econet’s new bundles? More than just a dream – What’s the idea behind Econet’s new bundles? What’s the best sort of deal you can get on mobile broadband from Zimbabwean telecoms operators? With the way the telecoms industry is going through a lot of changes, that’s the one question that will get multiple answers this year. This weekend we saw Econet’s own response through the introduction of its Dream Data Bundles. Priced at $1 for a daily allowance of 300 MB and $2 for a 3-day 750 MB package, this is probably the most generous Econet’s been in terms of broadband. Ordinarily, data bundles from Econet put 10 MB at $1, a 200 MB bundle at $10 and 500 MB at $20; rates that are more or less mirrored across all local mobile networks. There is one huge disclaimer though; these Dream bundles only apply from 12 am to 5 am, something that I think steals a lot of appeal from the new package. It looks like this graveyard shift strategy, which is used in other markets by different operators, is meant to boost Econet’s revenue by capitalising on off-peak periods that have lower data consumption patterns from subscribers. The Dream isn’t a response to Extra and Lite Bundles? While it’s easy to look at this as Econet’s response to the public outcry against the operator’s adjustment of the social media bundles, there’s actually more to suggest otherwise. The Dream Data Bundles have offered no concessions to social media. If you have Facebook, WhatsApp or Opera Mini bundles, you can’t access them on the dream bundles. 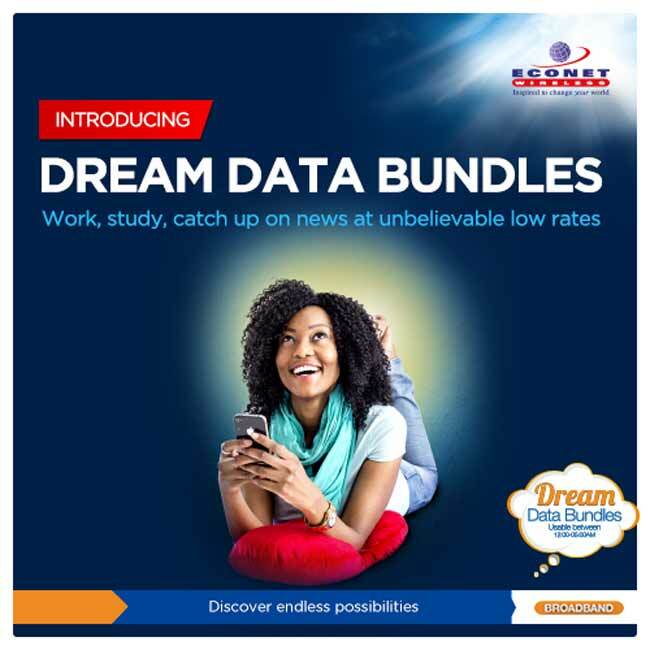 Dream bundles are meant to sell the internet as a complete package (albeit with Night Owl conditions), rather than in portions/bundles that require Econet to offer more for each service to make it seem appealing. It’s safe to assume that this is just the first of many trials on different broadband packages that Econet will work with, outside the complications of Over-The-Top(OTT) services like Facebook or WhatsApp bundles. Sure, Econet can say all it wants about how it competes on value rather than price, but the broadband landscape has changed rapidly in the past few months with entrants like TelOne coming in, brandishing WiFi services that are 90% cheaper than everything else from the mobile operators. More than anything else, it looks like Econet is responding to these players that want a piece of the mobile broadband action and are pricing their way into the game. Broadband is going to be a fertile ground for product experimentation because of its increasing contributions to Econet’s bottom line and while OTT services like bundles did very well for Econet and every other operator, there’s only so much that can be done to profitably modify them without agitating loyal users. Econet’s gambit will be that products like these new dream bundles cultivate an appetite for internet services outside Facebook and WhatsApp. This is where the huge financial benefits in broadband actually lie in the long term. Who would want to wake up at 2AM to browse internet? This is a stupid idea from Econet. I can safely say that in the past week alone Telecel must have had more than 100 000 new customers coming their way. They need to wake up these money hungry ecothieves. I hear that Telone is starting to have partnership with private house holders to host public wifi in every street starting with Avondale. This is the same concept British Telecoms company do, you get their wifi signal at almost every inch of UK land, its in buses, in trains, every street, etc. may sound ungrateful but really, Econet shoulda dun this long long back if this was in good faith. Night bandwidth is largely unused and $1 for 300MB THAT EXPIRES THE SAME NIGHT is still what Econet does best – charge extortionately with no regard to the impact of the connectivity that they deny Zimbabweans. No. I’m not dismissing their contribution to the country in connecting us where Telecel and NetOne have failed dismally. They have connected us and we’re paying to connect but they should stop making us bleed for it. Browsing Internet btwn 12am-5am??????????????????????????????????????? ?, when will this suffering in the hands of ecothieves end??? Can Telone destroy this selfishness once and for all, roll the WiFi in each and every corner in towns,in Kombis and even in High Density Suburbs. the fact that facebook, whatsapp and opera are blocked means DPI (deep packet inspection) and for Econet that means probably blocking the good old torrents that we have come to love amongst other things. This certainly will not work for me. how does Africom compare on its data offerings? So let make sure I’ve got this right: These witching hour bundles will not cover facebook, opera and whatsapp as long as you have an active bundle for the respective app/service? I guess there might be some value in this but I can’t help but feel this is half baked. Maybe if it had slightly more reasonable validity hours as someone suggested. really they is always an alternative econet…..we can always use wifi and do wat ever we want….wen ever we want….this is daylite robbery…. Its now $1 for 1GB and $2 for 3GB. Nice work! These bundles are not the only econet offerings, plan wisely and they will be beneficial to you.